Pasta: Fresh, Simple, and Delicious, written by Valéry Drouet and Pierre-Louis Viel, features 50 unique dishes using a favorite versatile ingredient, pasta. This no-frills book focuses on beautiful photos and recipes for all tastes and occasions, from salads and baked dishes to filled doughs and dessert-worthy offerings. Along with the review, I’ll also be sharing a recipe perfect for summer- Dondolini Salad with Grilled Peppers and Feta. The recipes and food styling are provided by Valéry Drouet. Valéry is a food stylist in the advertising industry and has written many other cookbooks including Cakes!, Fish & More, Burgers, Meat, and Meatballs. Photography is by Pierre-Louis Viel with every single recipe accompanied by a full page photo of the finished dish. The chapters are divided into three sections based on type of pasta: Pasta Secca (Dried Pasta), Pasta Fresca (Fresh Pasta), and Ravioli (Filled Pasta). For those new to working with pasta, there are tips for picking out and cooking dried pasta. You will also learn how to make fresh pasta and naturally dye the dough pink, black, green, and yellow. Step-by-step photos are provided for shaping farfalle, orecchiette, ravioli, and tortelli. Don’t have the time to make your own fresh pasta? Valéry says that the recipes in the Pasta Fresca section can also be prepared using dried pasta. For days when you simply want to pair pasta with a sauce, there is a collection of basic sauces following the pasta chapters: Tomato Sauce, Bolognese Sauce, Curry Sauce, Pesto, and Gorgonzola Sauce. Measurements are provided in US Customary and Metric. Preparation, cooking time, serving sizes, and tips are also included. The name of the dish is written in English. This book is a great pick for pasta lovers. I own quite a few pasta-centered cookbooks and this one includes many dishes and flavor combinations that I have never seen before. Some of the more interesting ones that stand out include the Vermicelli with Crispy Celeriac, Parma Ham, and Early Grey; Shrimp Parcels with Balsamic Glaze; Zebra Pasta with Lobster and Garlic Sauce; Poppy Seed Tagliatelle with Black Pepper Cream, Chipolatas, and Pecorino; Linguine with Mustard Seeds and Beef; and Cheesy Pasta Cakes. There is a recipe for everyone from fresh to dried, sweet to savory, vegetarian to meat-based, and simple to complex. Many of the dried pasta dishes are perfect for weeknight meals. Most of the ingredients are available in the average grocery store. Some of the more difficult to find dried pasta shapes can be substituted if unavailable. Other less-common products include celeriac, Parma ham, certain types of cheese, crème fraîche, oyster mushrooms, fish sauce, cockles, bottarga, smoked duck breast, squid ink, oxtail, and lardo di Collonnata. 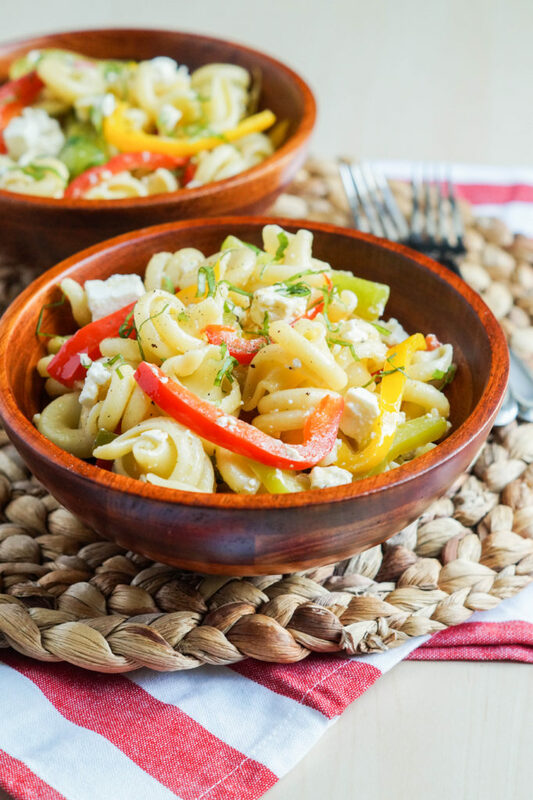 I love lighter pasta salads and this Dondolini Salad with Grilled Peppers and Feta is no exception. 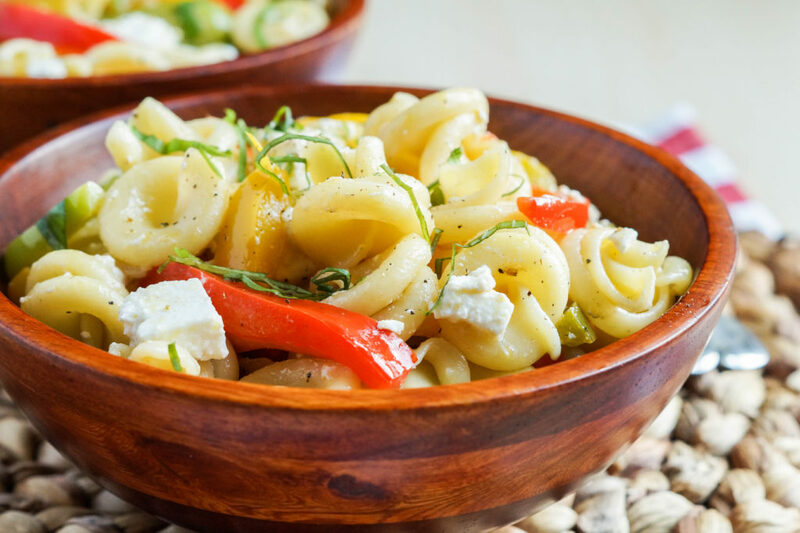 Dondolini pasta is tossed with colorful grilled bell peppers and feta, then seasoned with a light vinaigrette and basil. It is the perfect summer dish to take along for a picnic or other event. I halved the recipe to better serve our family, but have included the original proportions for about 6 people (or more as a side). Dondolini is a type of dried pasta that is shaped into spirals. The photo in the book used tricolor pasta. I was able to find a similar type called Molloni in a larger grocery store. You can also substitute with your favorite medium dried pasta shape. I grilled the bell peppers until charred on all sides, then transferred them to a covered bowl. If covering with plastic, make sure the wrap doesn’t directly touch the peppers. As the peppers cool, the trapped steam helps loosen the charred skin. This will make it easier to peel off. This salad can be served immediately or after refrigerating for a couple of hours. 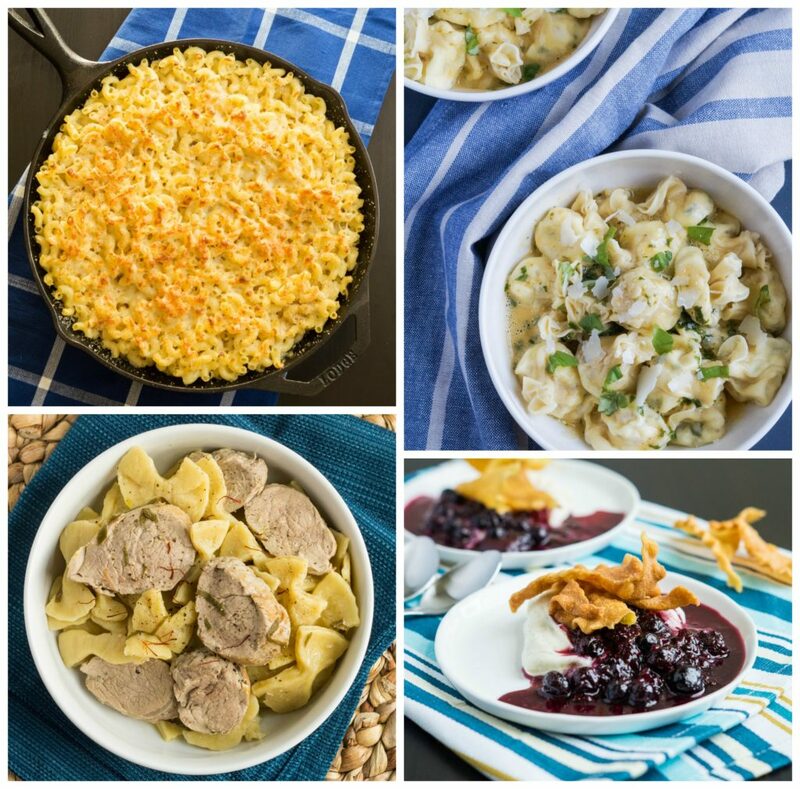 I also made Classic Macaroni and Cheese, Goat Cheese Pine Nut and Basil Parcels, Saffron Farfalle with Pork and Sage, and Ravioli Crackers Mascarpone and Berry Compote. The Classic Macaroni and Cheese is a gratin-style European version, compared to the thickened American version. The dried pasta is prepared the night before by cooking until al dente, then soaking overnight in milk. The next day, the noodles are drained and combined with Gruyere, breadcrumbs, butter, and cream. It was perfect for an easy lunch and quite the hit with both of my children. This was my first time making pasta parcels at home and they are such a fun shape. For this recipe, the pasta is stuffed with goat cheese, pine nuts, and basil. They are served in a basil crème fraîche sauce. This is a great pick for those who love goat cheese. The Saffron Farfalle with Pork and Sage was a delicious combination that would be perfect for fall. Homemade pasta is flavored with saffron, rolled out, then formed into the butterfly shape. My pasta was a little thicker since Evan wanted to try out hand-rolling, but it still tasted great. The pork tenderloin is simply seasoned and cooked before coating in a white wine sage sauce. I love the dessert offerings in this book. The Ravioli Crackers with Mascarpone and Berry Compote was one of the more involved recipes I tried, but definitely worth it. Lasagne noodles are cut into triangles, then fried until crisp. They are served with a sweetened mascarpone cream and mixed berry compote. Disclaimer: I received this book from H.F. Ullmann in exchange for my honest review. All comments and opinions are my own. On a heated grill or under a broiler, cook the peppers whole until the skin is charred on all sides. Transfer to a large bowl, cover, and allow to rest until cooled, about 20 minutes. Remove the stems and seeds from from the peppers. Peel off the charred skin and slice the peppers into thin strips. In a large pan, drizzle 3 tablespoons of the olive oil over medium high heat. Add the sliced peppers and cook for a couple of minutes before adding the garlic and seasoning with salt and pepper. Cook until fragrant, about 1 minute, then remove the pan from heat. Stir in the vinegar, remaining 4 tablespoons olive oil, and basil. Allow to cool. Bring a large pot of salted water to a boil. Add the pasta and cook until al dente, just tender. Drain and place in a large bowl. Gently toss with the feta and pepper mixture. Serve at room temperature or refrigerate for 2 hours and serve chilled. Am a cook book collector – I would definitely be on the look out for this one. Cause I love all things pasta. Thanks for sharing!!! 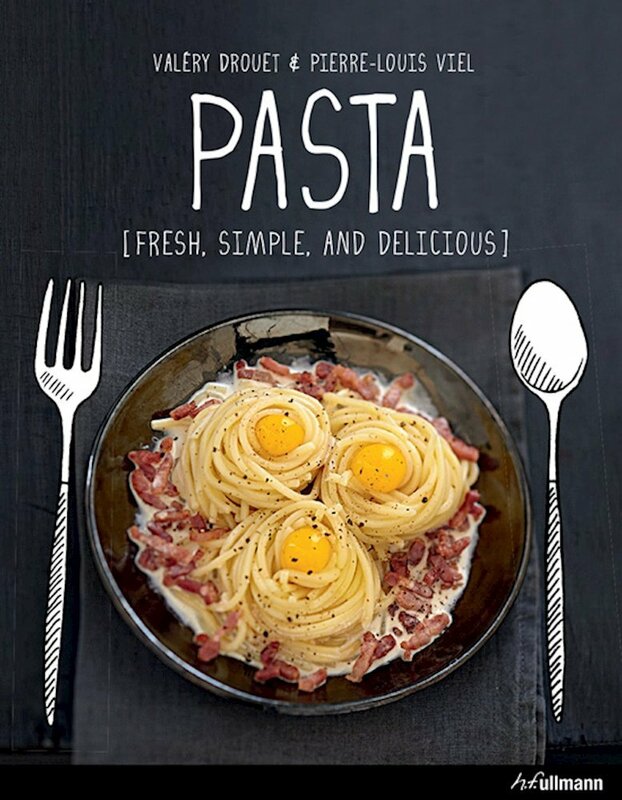 I absolutely love pasta meals, so this book looks like a must-buy for me! This salad looks so good! Pasta is so comforting and delicious. It’s my go-to weeknight meal. This book looks great! And I love this recipe too–anything with feta–yum!! Though I am not a huge fan of single-ingredient cookbooks, it looks like you’ve really made the most of this one! Beautiful styling, and I especially love the unique dessert ravioli ribbons and the homemade goat cheese pockets. Lovely work! It sounds like a great book and I love the sound of some of the more unusual pasta dishes like the one with poppy seeds. I was looking for a fresh new salad recipe and came across this. 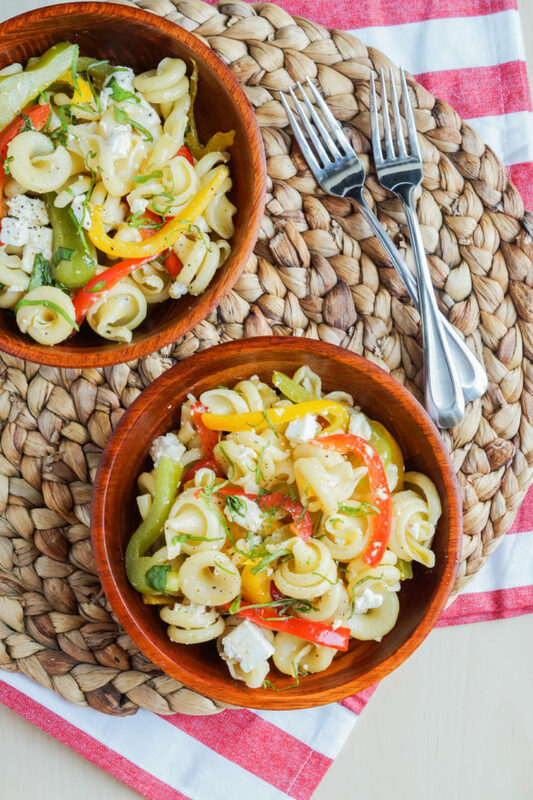 It sounds so delicious and shares my love for pasta and peppers! YAY! I cannot wait to try it.